With bellies full of little breads we got into the car after breakfast and began the journey north. 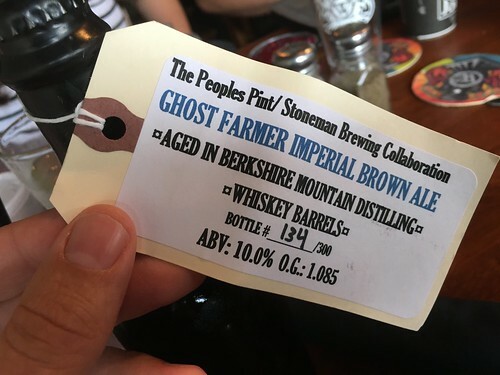 After about three hours of driving we stopped in southern Vermont at Whetstone Station, an incredible brewhouse with fantastic beer and wonderful food overlooking the Connecticut river which, surprisingly, marks the border between Vermont and New Hampshire. We met a friend, Frank, who was kind enough not only to meet us for lunch but to bring along this wonderful rare ale for my collection. We dined inside but I spent the majority of the meal chasing Josephine around the restaurant and making sure she didn't leap over the railing and into the river below. This is pretty much all there is to do when you take a fifteen month old to a restaurant of any kind, particularly after strapping them into a car seat for multiple hours. 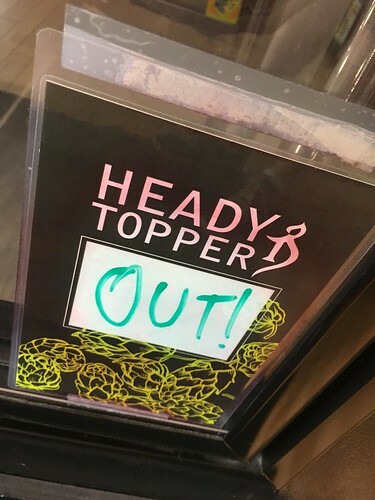 On the road to Burlington I tried to procure some Heady Topper but, as always, I was hours too late to stand a chance. As we approached northern Vermont we made a point of stopping in one of our favorite cities: Burlington. 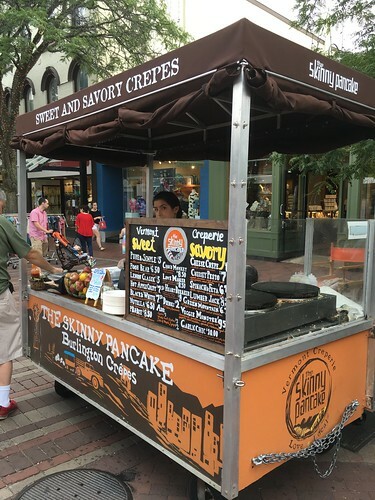 Like all times we are downtown in Burlington, we were starving, and made a point of hitting up our favorite crepe cart. The children were out of their minds after an entire day in the car and ended up running through the downtown nearly knocking pedestrians over. As Jen went back for a second round of crepes an obviously drunk man approached me and Josephine and kindly told me how cute she was and how blessed I was. He then turned to someone else and said, "Don't look at me like that. I'll f--- you up!" We trekked on, entering Canada around sunset and making our way to our Airbnb where the kids stayed up until about midnight, playing with their kindles and waiting for the rest of the family to meet us. The next morning we woke up early and the boys and I headed out with Auntie Lisa to pick up groceries for our stay. We returned back to have the inaugural swim at the new place. The boys were super excited but Josie decided that she hated the float we got for her so we ended up having to hold her the entire time we swam. Elliott swam so much that he developed a nasty rash from the bathing suit lining and had to sit out a day, much to his disappointment. We later went to Great Grandpa's to get some quality time with the nicest man in Quebec. Great Grandpa was treated to an amount of wrestling he likely seldom sees on a daily basis. Despite our repeated apologies for destroying his apartment, Great Grandpa insisted he was delighted to have us over. Later that day we went to visit Cousin Sophia for her birthday. The approach through the flock of lawn flamingos is now remembered as a top ten moment of the trip for the boys. Coming in slightly above that was the shrimp which Peter grilled up. They were, indeed, some of the tastiest shrimp I've ever had. I say that despite only gettin ga few bites as all three children continually descended upon me each time I sat down with a skewer. We managed to get this picture of 8 our of 9 Great Grandchildren all together (one was napping). Grandad brought up the bouncy house partly so the children could use it the next day at Great Nana's birthday party, partly so he could complain about having to lug it around. It was enjoyed though not as much as he had hoped for the hassle it caused him. The Canadian cousins took to Josie very quickly. They were quick to embrace her, perhaps because she was the least likely to try to steal their toys. The sisters wished Great Nana a happy birthday before we headed back for the night. Martin enjoys being self sufficient and was quick to figure out that if he piled everything up in the bathroom that he could reach, then put the bathroom scale on top, he could use that as a platform to reach the sink to wash his hands. Everyone in the family came over that night and the guys went out to pick up Palestinian food. I don't know why but Elliott was more excited about Palestinian food than he has ever been about any food, or anything for that matter. He just kept pointing at things he wanted to try, trying them, then exclaiming about how yummy they were. It may have been his best moment in life. The following day we returned to Great Grandpa's where we undid any cleaning he may have done since our previous visit and had a tea party with him. Then it was off to Aunt Nancy and Uncle Jim's for dinner where were were able to get a better picture of fewer grandchildren. Since the kids were in a before bed frenzy it took about eight hundred shots to get this one. Montreal took its toll on the kids in the form of dozens of mosquito bites. Nowhere else on our trip did we really encounter any mosquitoes but in Montreal everyone got attacked. Lauren even had the opportunity to get stung in the neck by a wasp. I'm pretty sure a three day trip through Panamanian rain forest would have yielded fewer bug bites than we suffered in Montreal. After an ill advised morning of delays we ended up at a Costco in Montreal for lunch and passport photos. With their photos taken we are now able to get the kids their Canadian passports. That is assuming that the notoriously picky Canadian government accepts the photos. On the trip to Toronto we encountered many parts of the highway closed for construction. 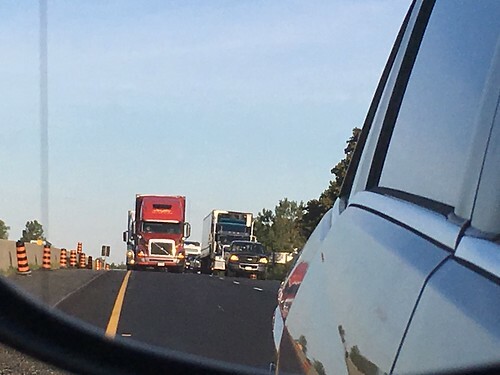 One such slow down caused a several hundred foot gap in traffic when a truck and another driver were engaged in a fifteen minute shouting match. I was confident they were eventually going to get out of their vehicles and start throwing punches but somehow the drivers were able to settle their differences simply by shaking their fists and hurling insults. It was a better outcome than we can generally expect in a similar situation in America. 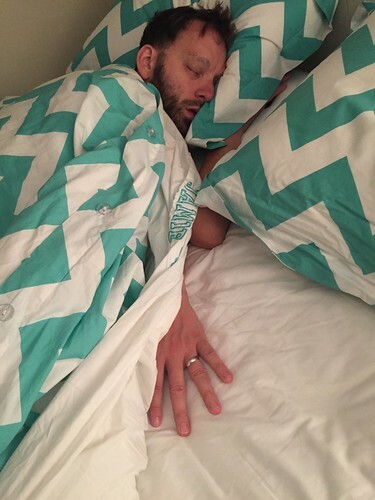 We rolled into Toronto pretty late where we had dinner and cousin Tim was there to engage in a Jedi training session with the boys which riled them up but made them sleep like champions through the night. The next morning, before leaving for Kalamazoo, Aunt Wendy made the mistake of asking the boys what they wanted for breakfast. Elliott asked for cereal, Martin asked for a soft boiled egg with toast. I'm not sure why since I don't think we've ever made that for him. However, Aunt Wendy is a lot more accommodating than we would have been. As Cousin Tim left for hockey practice, Martin and Elliott got a chance to try on some of his equipment and Grandad gave them some pointers. We then departed, got on the highway and stopped at a Tim Horton's about an hour away for breakfast where we realized we'd forgotten the bag with our passports. I took it rather poorly but by the time we got back to Aunt Wendy and Uncle Glenn's I'd shaken most of the intense anger I felt and we decided to stay an extra day in Toronto. We took advantage of the day but exploring a tiny portion of the Toronto Zoo on an incredibly hot day. The line said it was 45 minutes to see the giant pandas but an insider at the zoo let us know the signs told lies and, indeed, we were able to get in line and see the and pandas in under ten minutes. 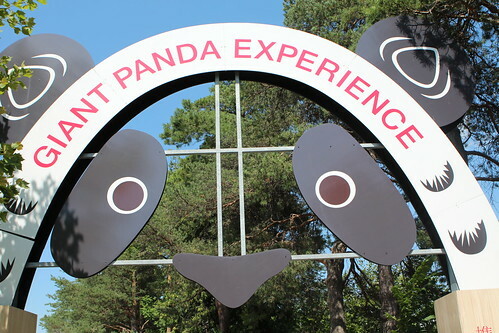 This was good because seeing pandas in a zoo is, overall, pretty disappointing as they just lie around and generally look miserable. Elliott had more fun just using the kiosks to learn panda facts. There was also an enormous splash pad where the kids had a great time running around and cooling off. 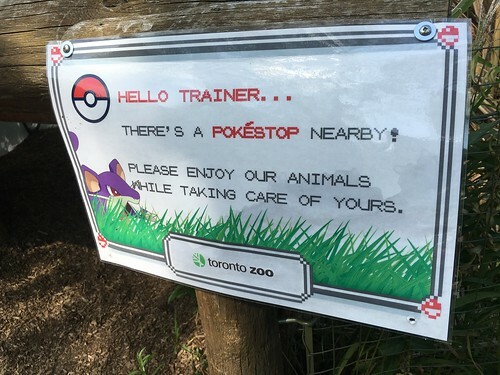 The Toronto Zoo also happens to be a pretty happening spot for Pokemon Go so there were signs everywhere alerting everyone to be aware. I'm guessing more than one person has been run over by a zoo employee in a golf cart trying to catch a Sandshrew. Another bonus of staying an extra day late is we got to see Lynn and Peter, mother and father to my best friend, Paul. They got to meet the children for the first time and we got to catch up. Unfortunately Josie had her only bad night of the entire trip right as we were planning on getting up at 5:00 AM to set out early for Kalamazoo. It was a slow start the next morning. After a bit of driving we made a stop at the duty free where the kids ran wild and we stocked up on supplies before crossing the border. Back in the States we went to Kalamazoo and visited the Air Zoo. The Air Zoo could not be a better place to spend an afternoon with kids. There are airplains, museum pieces, and amazing carnival rides that are clean, safe, and manned by people that don't look like escaped felons. Despite repeatedly begging to go on rides, Josie was not a fan of any of the rides she tried. 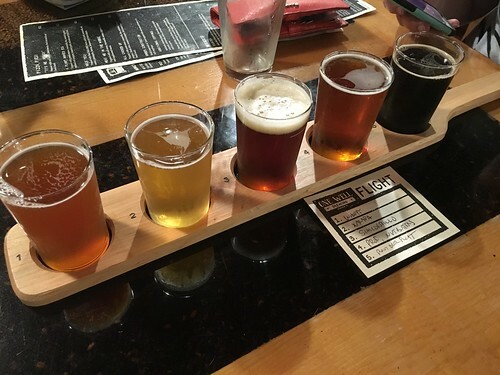 We then met up with Auntie Lisa and Uncle Adam at One Well Brewing where we had some amazing food and beer before making the final leg of our journey home. One Well Brewing had really great beer and I shared a flight with Jen before we headed out. The boys didn't eat much but they entertained themselves with a lot of pinball and video games, pretty much ending the trip on the best note possible. We made the remaining two-and-a-half hour drive nonstop and got the kids to bed with relatively no fuss. Overall it was a fantastic trip. 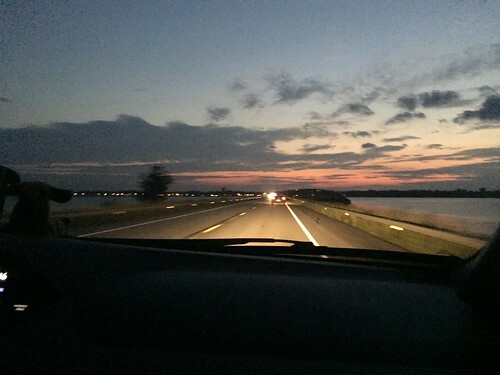 Two years is enough time to pass to trick you into wanting to do a road trip like this again. The difficulty and frustration melts away over the years and you only remember the fond memories and times spent with family and friends. Josie was at probably the most challenging age to do a trip like this. If we were to do it again in a year things would be much easier as she would be much more prone to sit there and watch all of Frozen without getting bored. Mr. Rogers seemed to be the only thing that would keep her interest on this trip. The comforting thing is that with the three children any future road trip will be easier. Sixteen months may be the most challenging road trip age we've ever encountered. Not really for any reason other than that Josie just wanted to get out of her seat and run around at all times. Who can blame her when she has newly learned the skill of walking? Similarly I just wanted to get out of my seat and play Pokemon Go as I had newly aquired this skill before the trip. So I can relate. I guess we all have to "catch 'em all" in our own way.